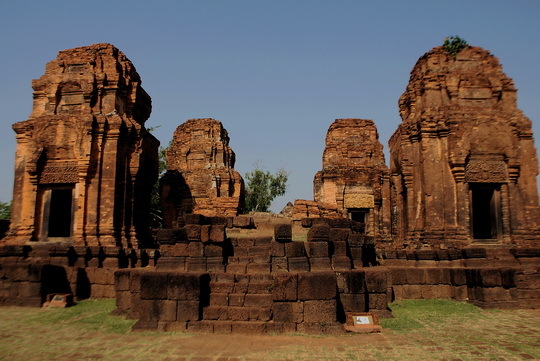 The Angkor-period temple of Muang Tam in Buriram province is closely associated with nearby Phanom Rung. Prasat Muang Tam lies four or five kilometres as the crow flies on the plain beneath the extinct volcano on which Phanom Rung is sited. And while the latter was certainly the most prestigious religious site and pilgrimage destination of the area during that period, the former is considered to have been the main urban centre and capital of the region. 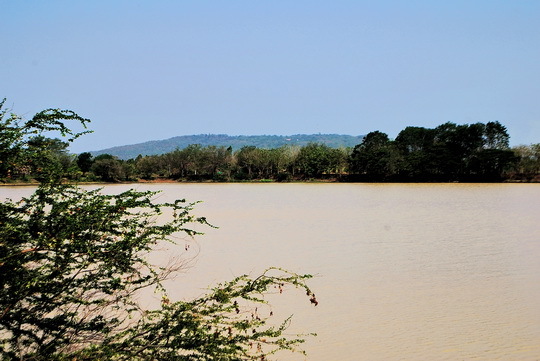 The baray or reservoir with Phanom Rung in the distance. What you can see at Muang Tam would have been the central temple of that urban area and would have been surrounded by wooden and bamboo housing, roads and reservoirs — the largest of which is still in use — while an ancient road heading towards the nearby hilltop temple can also be clearly seen. 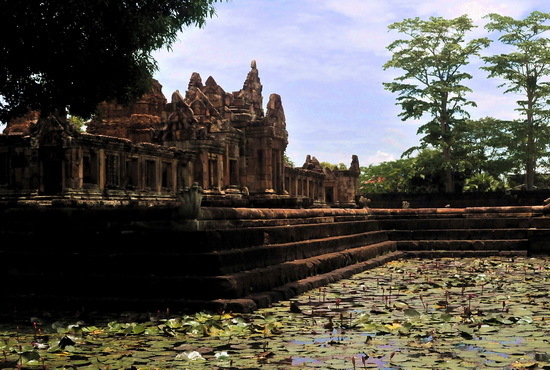 Dating the temple is problematic since, as with the majority of Angkor period sites, they were continually upgraded by successive rulers and kings but most of what you can see today is probably 11th century, so slightly earlier than its neighbour Phanom Rung. The central brick towers are consistent with a late 10th century design — that is, the Rajendravarman or Jayarvarman V period — so the site was likely inhabited for a period of no less than 200 years. Indeed the simpler earlier version with just five central brick towers and surrounding moat can clearly be seen with the more elaborate outer gallery, wall and gopuras being a later addition. Perhaps not version one but the earliest remaining elements of Muang Tam. The later additions of impeccably proportioned entrance gopuras and outer gallery plus the attractive four L-shaped ponds, these days are full of crimson water-lilies, make the temple particularly pleasing to the eye and even though it’s a less prestigious and well known temple than Phanom Rung, for many visitors it is the more aesthetically pleasing of the two. 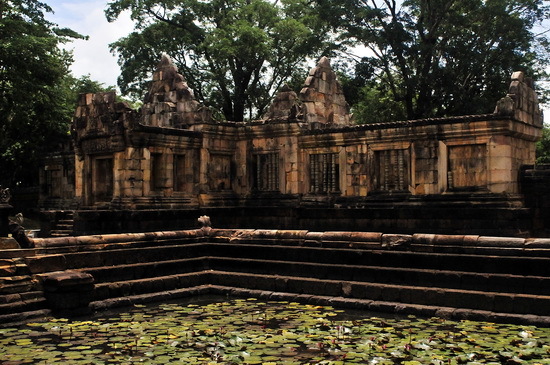 Northern gopura and one of the ponds of the inner enclosure. Furthermore Muang Tam is far less crowded with visitors than its neighbour, which is a big plus when exploring such sites as this where atmosphere is a big part of the experience. Another attractive view of this picturesque temple — this time seen from southeast. It’s also notable that Muang Tam has many fine carved lintels which are often in better conditions than the Phanom Rung ones, particularly the oldest ones in the central brick towers. 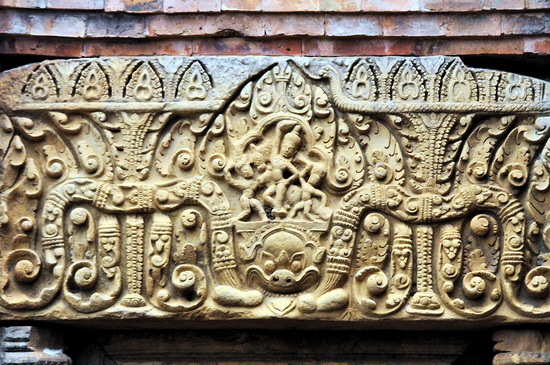 Bear in mind that the wonderful lintel above in high relief was carved the best part of a thousand years ago. 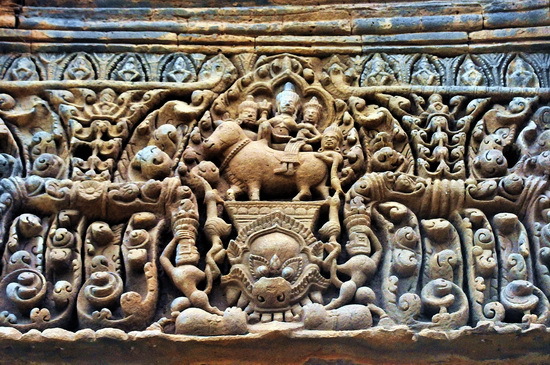 This one features Shiva and Uma on an ox above the doorway’s guardian figure Rahu. 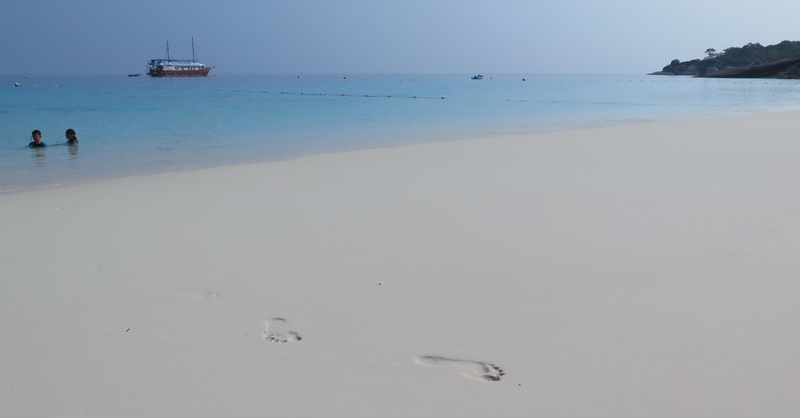 We reckon the above is Krishna, though wouldn’t guarantee it. Regardless, it’s another beautifully preserved 10th/11th century carving. Admission to Muang Tam is 100 baht for foreigners or a 150 baht ticket gets you into this and Phanom Rung. Open 06:00-18:00, daily. There is a small exhibition centre near the entrance and a car park with drinks and souvenir stands. There’s also a homestay behind the ruins if you feel like hanging around. Muang Tam is eight kilometres southeast of Phanom Rung and is clearly marked by signs. If coming by public transport, catch a Chanthaburi-bound bus in Buriram or Nang Rong and ask to be let off at Baan Ta Pek, where you can hire a motorbike taxi to take you to both Phanom Rung and Muang Tam for around 300 baht. Honey Inn and other guesthouses in Nang Rong offer several tours that include Muang Tam as a main stop. Many also visit as a day trip from Surin, Buriram or even Khorat.